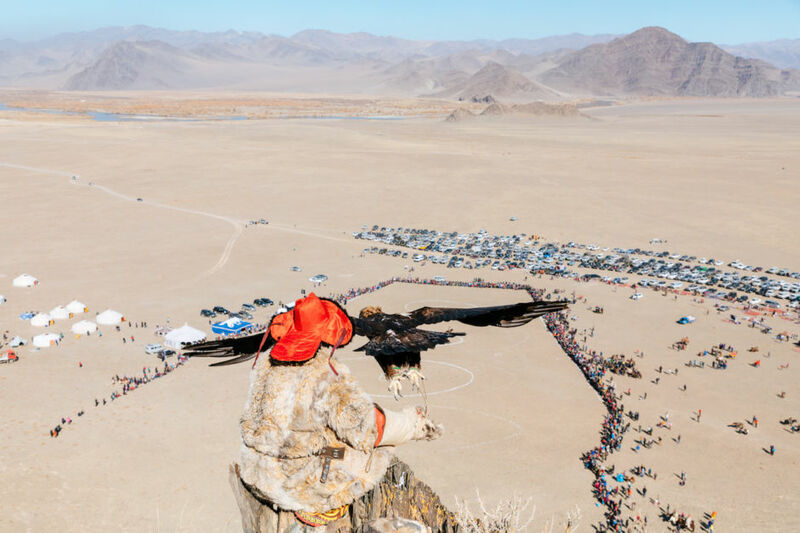 The annual Golden Eagle Festival in western Mongolia, near the town of Ölgii, is fast becoming one of the country’s most popular tourist attractions. 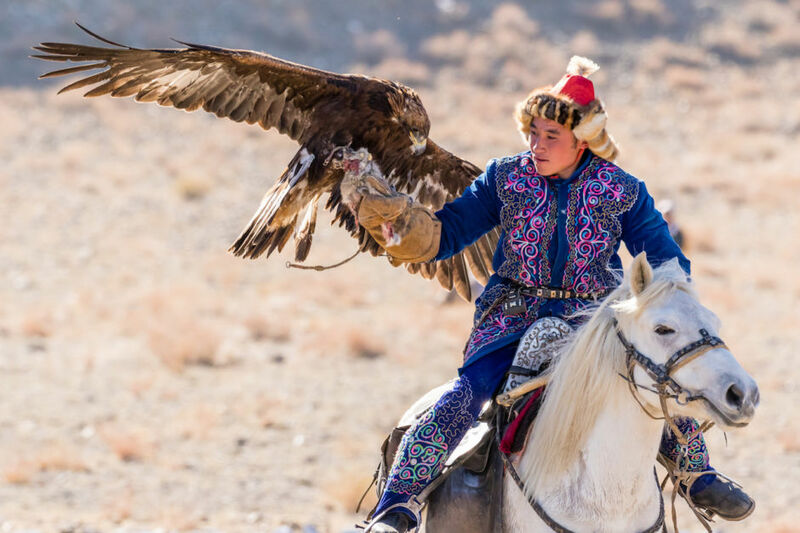 The tradition of capturing and taming young eagles and training them to hunt wild animals such as foxes dates back many hundreds of years for the Kazakh nomads who live in this area of Mongolia. 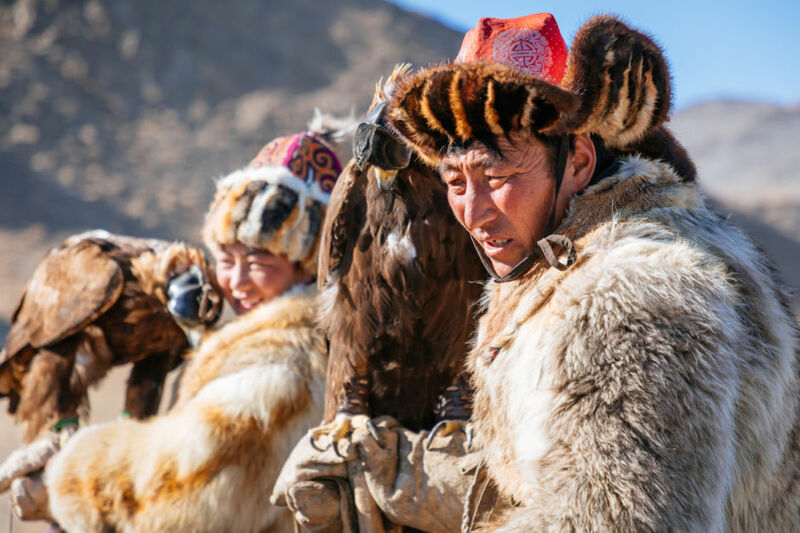 Each year, hunters gather to celebrate this tradition, listed as Intangible Cultural Heritage of Humanity by UNESCO, at the Golden Eagle Festival. Adventure travel photographer Andrew Peacock was there in early October and captured these amazing images to tell the story of the festival. An eagle takes flight from a handler on the rocky outcrop above the arena in response to calls from its owner far below. Depending on which circle the hunter is in when the eagle lands on their arm determines their score, i.e. six, eight, or 10, the maximum amount of points. Circle 10 is the farthest away from the hill where the eagles are released; therefore, it takes the hunter a stronger voice to call out to their bird, and it takes the bird a greater amount of time to reach its hunter. The game is timed, so hunters aiming for Circle 10 need to have a fast bird. 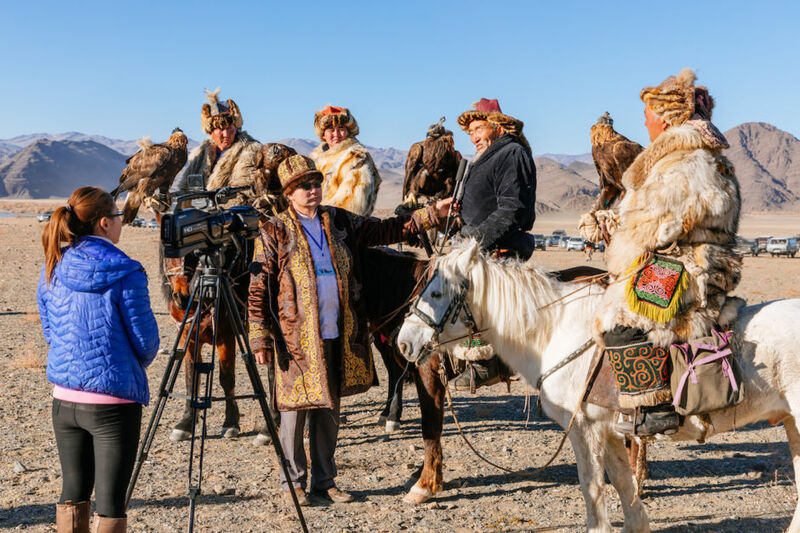 A few years ago, a young woman named Aisholpan made history as the first female to compete at the festival. 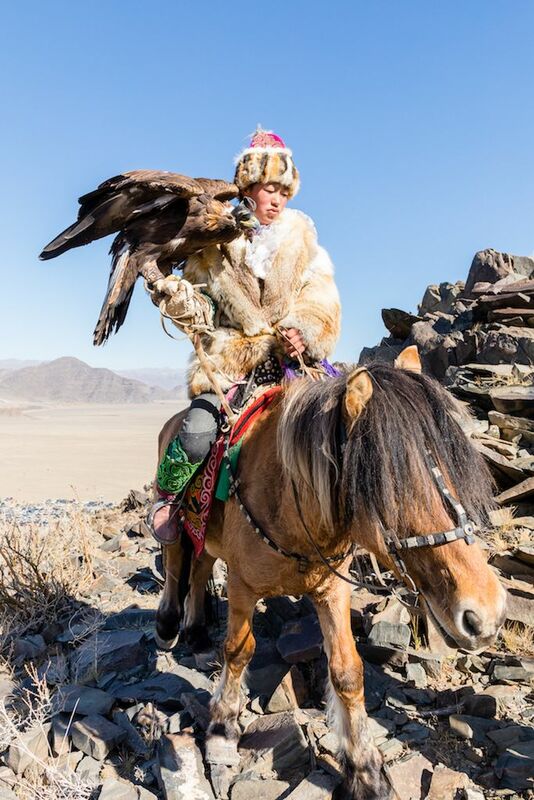 She won the “Best Horse and Equipment” prize that year and was the subject of a popular documentary called The Eagle Huntress. 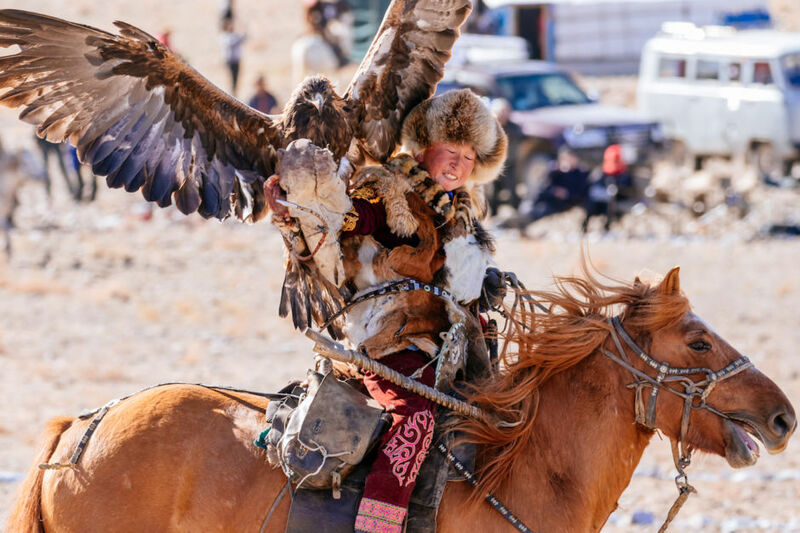 Now, other young women like this hunter at the 2018 festival are following in Aisholpan’s footsteps. 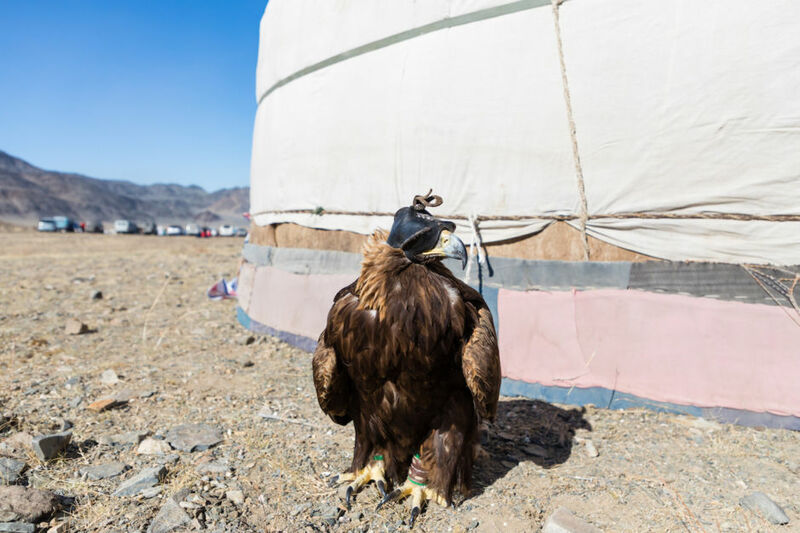 A hooded golden eagle is rested and tethered beside a ger between competitions. 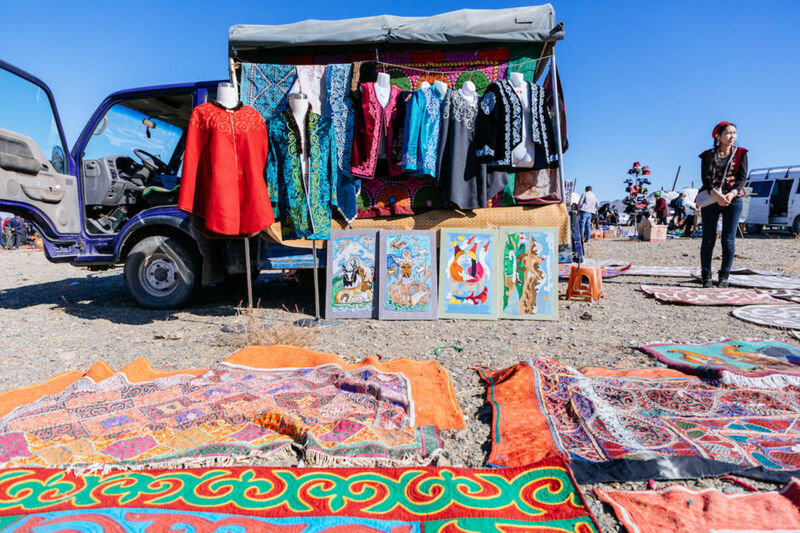 This once-a-year event is an opportunity for locals to sell traditional clothing and textiles to visitors from Mongolia and overseas. A young eagle hunter braces at the impact of an 18-pound eagle landing at full flying speed on his outstretched arm, protected from sharp claws by a thick leather glove called a biyalai. 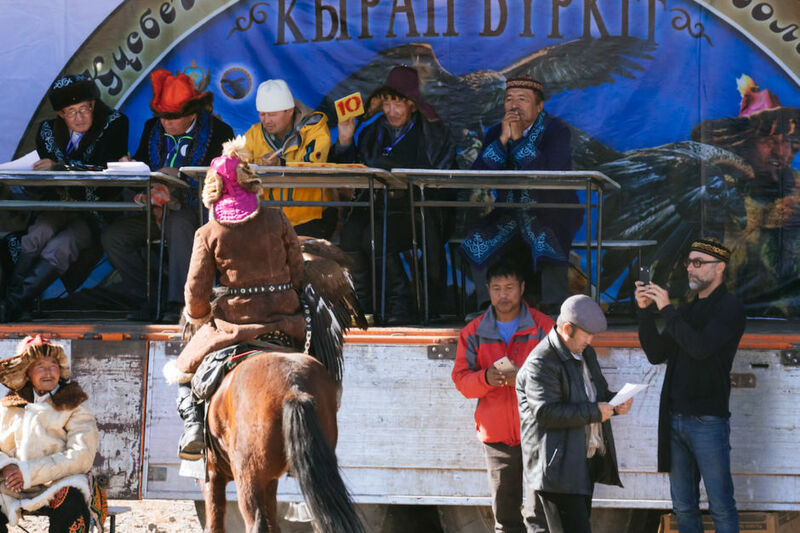 An eagle hunter faces the judges’ podium and receives a top score of 10 in the competition. Hunters are judged by how well-trained their eagles are. An eagle hunter has successfully called for his eagle to fly from the release point high on the nearby hillside to land on his arm. A piece of meat is used to entice the eagle to land quickly as the time taken to reach the hunter is taken into account in the judges’ score. 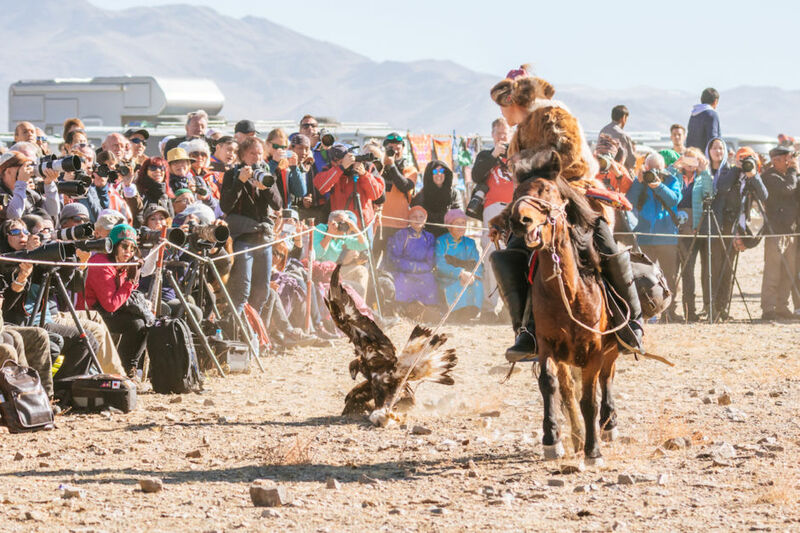 Note that there were no live animals used as bait during the 2018 Golden Eagle Festival. 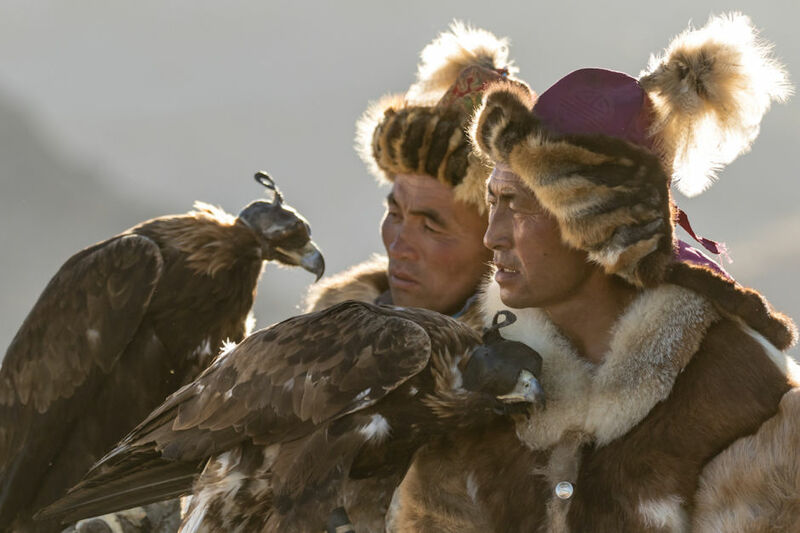 Since the release of the documentary The Eagle Huntress, the festival has become very famous. Each year, it attracts more and more visitors and journalists eager to learn more about the hunters and their way of life. 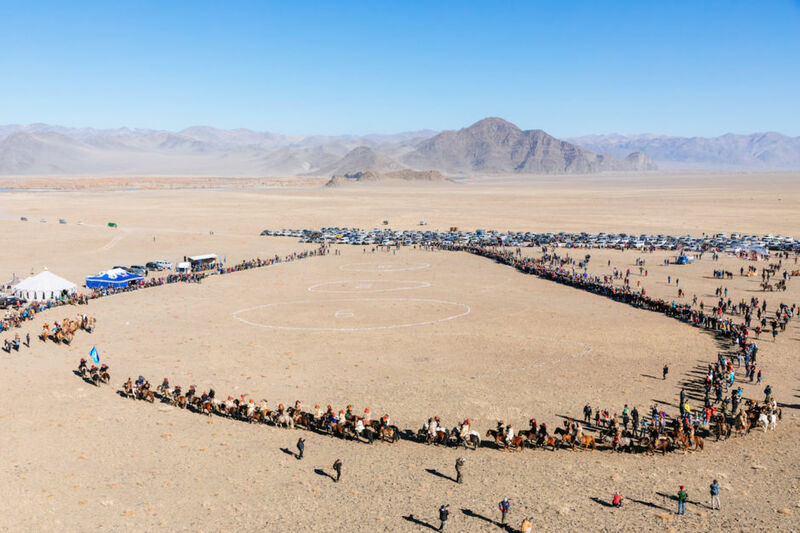 One of the events of the festival is the Kumis Alu event, literally “pick up the coin.” This game is a real test of horsemanship as it requires the competitors to gallop a horse at full speed while reaching to pick up a coin wrapped in cloth placed on the ground. Father and daughter eagle hunters wait and observe on the sidelines of the festival. 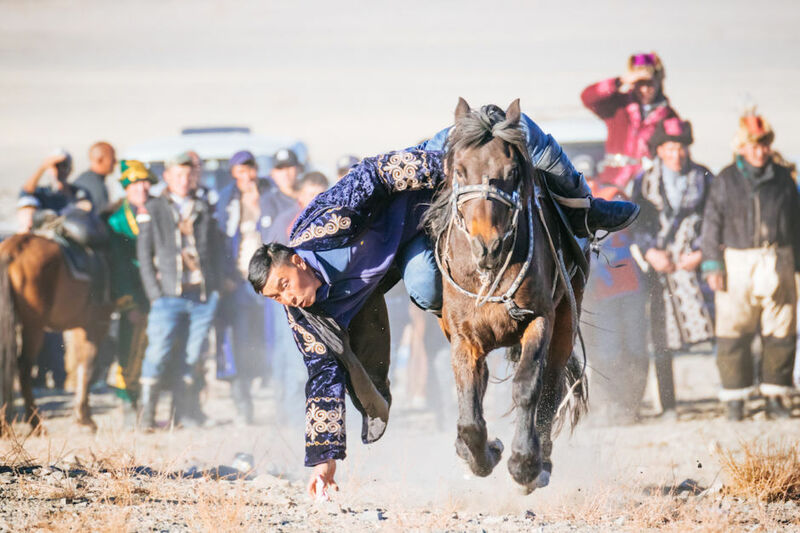 In this event, the aim is for the hunter to call an eagle from the rocky hill far away and entice it to land on the “prey” - an animal carcass being dragged behind the horse. 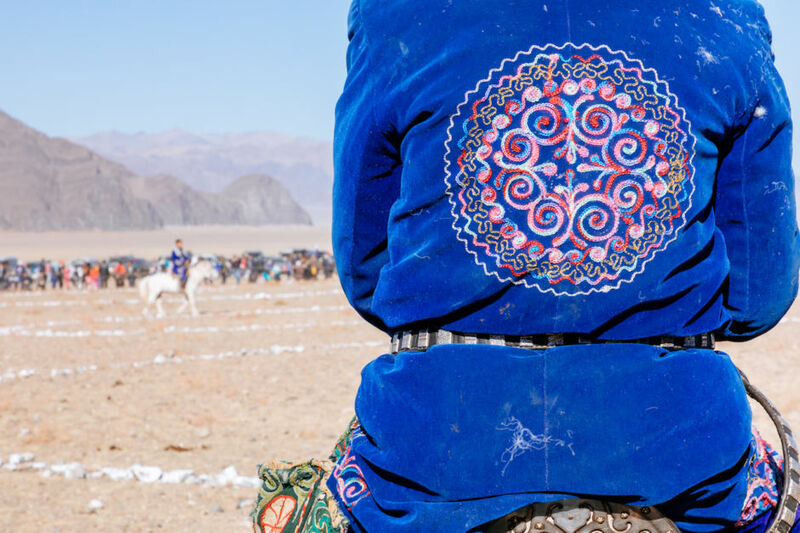 A man on horseback wearing a colourful traditional Kazakh cloak watches the events from the edge of the arena, waiting to compete. 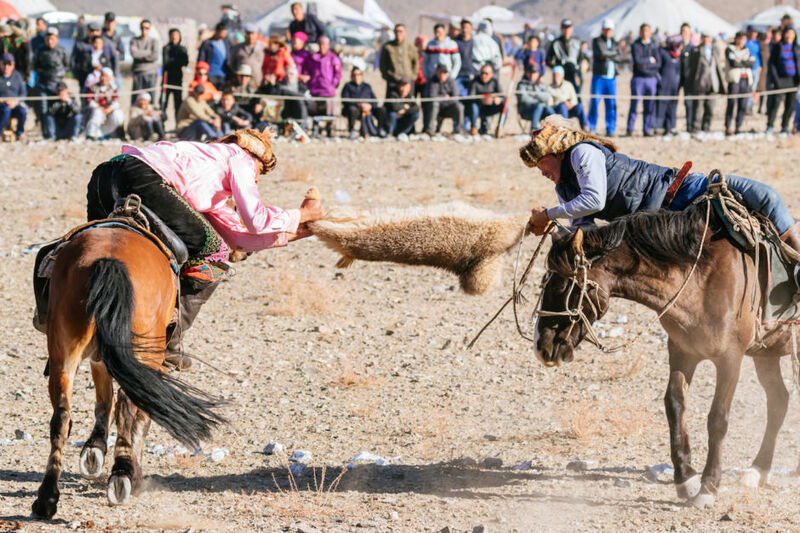 Kokpar is a popular event where two horse riders grapple for possession of a decapitated goat carcass. 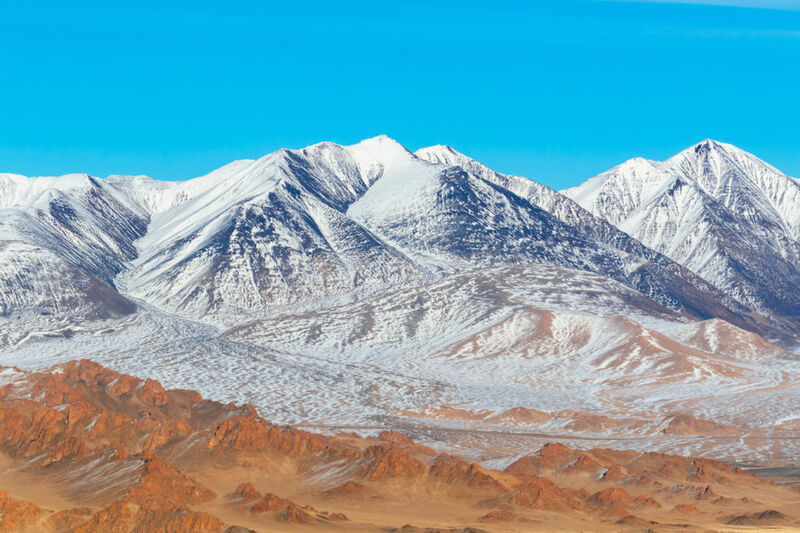 The beautiful Altai mountains near the town of Ölgii in western Mongolia where the Golden Eagle Festival takes place every year.